This article is about the county. For the former parliamentary constituency, see East Sussex (UK Parliament constituency). Not to be confused with South Essex. Sussex is traditionally sub-divided into six rapes. From the 12th century the three eastern rapes together and the three western rapes together had separate quarter sessions, with the county town of the three eastern rapes being Lewes. This situation was formalised by Parliament in 1865, and the two parts were made into administrative counties, each with distinct elected county councils in 1889 under the Local Government Act 1888. In East Sussex there were also three self-administered county boroughs: Brighton, Eastbourne and Hastings. In 1974 East Sussex was made a non-metropolitan and ceremonial county, and the three county boroughs became districts within the county. At the same time the western boundary was altered, so that the Mid Sussex region (including Burgess Hill and Haywards Heath) was transferred to the county of West Sussex. In 1997, Brighton and Hove became a self-administered unitary authority; it was granted city status in 2000, whilst remaining part of the ceremonial county of East Sussex. 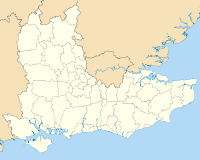 East Sussex is divided into five local government districts. Three are larger, rural, districts (from west to east): Lewes; Wealden; and Rother. Eastbourne and Hastings are mainly urban areas. The rural districts are further subdivided into civil parishes. From a geological point of view East Sussex is part of southern anticline of the Weald: the South Downs, a range of moderate chalk hills which run across the southern part of the county from west to east and mirrored in Kent by the North Downs. To the north lie parallel valleys and ridges, the highest of which is the Weald itself (the Hastings beds and Wealden Clay). The sandstones and clays meet the sea at Hastings; the Downs, at Beachy Head. The area contains significant reserves of shale oil, totalling 4.4 billion barrels of oil in the Wealden basin according to a 2014 study, which then Business and Energy Minister Michael Fallon said "will bring jobs and business opportunities" and significantly help with UK energy self-sufficiency. Fracking in the area is required to achieve these objectives, which has been opposed by environmental groups. East Sussex, like most counties by the south coast, has an annual average total of around 1,750 hours of sunshine per year. This is much higher than the UK's average of about 1,340 hours of sunshine a year. The location of settlements in East Sussex has been determined both by its history and its geography. The original towns and villages tended to be where its economy lay: fishing along the coast and agriculture and iron mining on the Weald. Industry today tends to be geared towards tourism, and particularly along the coastal strip. Here towns such as Bexhill-on-Sea, Eastbourne, and Hastings lie. Newhaven and Rye are ports, although the latter is also of historical importance. Peacehaven and Seaford are more dormitory towns than anything else. Away from the coast lie former market towns such as Hailsham, Heathfield and Uckfield; Crowborough is a centre for the Ashdown Forest. Lewes, the County town of East Sussex; and Battle, with its Norman Conquest beginnings, and Wadhurst are the other three towns of significance. The Seven Sisters Park is part of the South Downs National Park. Beachy Head is one of the most famed local attractions, along with the flats along Normans Bay. Apart from the physical landmarks such as the Downs and the Weald, East Sussex has a great many landmarks of historical interest. There are castles at Bodiam, Herstmonceux, Lewes and Pevensey; and defence works such as the Martello towers and Eastbourne Redoubt. Battle Abbey, built to commemorate the Battle of Hastings; Bateman's, home of Rudyard Kipling, Hammerwood Park, one of the first examples of Greek Revival architecture in the UK; and the University of Sussex buildings at Falmer are among interesting buildings. East Sussex has no motorways, and even dual carriageways are sparse in the county. The main roads through the county are those part of the radial pattern from London: the A21 from Kent to Hastings; the A22 from Surrey to Eastbourne; and the A23 from Gatwick to Brighton. Cross-country routes include the A26 which carries traffic from Newhaven and Lewes north into Kent; and the south coast trunk route, which starts in Folkestone (Kent) as the A259 trunk road, and traverses the south coast to Eastbourne, where it becomes the A27 trunk road and heads westwards towards Chichester in West Sussex and ultimately to Honiton in Devon. All the main roads suffer from congestion and traffic problems: the A27 which connects Eastbourne to Portsmouth is one of the busiest trunk roads in the UK. Bus routes serve all the main areas of settlement and many of the villages in the county. The railways serve the main towns in a similar fashion to the roads. Until the closures of many branch railways in the 20th century, rural East Sussex was well-served by rail: few such branch lines escaped the Beeching Axe so that today only main-line services remain. They include the East Coastway Line (including the Marshlink Line); the Hastings line; and the Uckfield branch of the Oxted Line. There are three heritage railways: the Kent and East Sussex Railway operates from Tenterden in Kent to Bodiam; the Bluebell Railway from Sheffield Park to East Grinstead; and the Lavender Line Steam Railway near Lewes. Trains in the county are operated by Southern, Southeastern, Thameslink and First Great Western. Southern is the key operator for the county, operating services along the West Coastway and East Coastway routes, as well as trains from Brighton, Eastbourne, Seaford and Hastings to London Victoria, and to a lesser extent London Bridge, which is also where trains to/from Uckfield go. Southeastern operate trains from London Charing Cross to Hastings. Thameslink operate trains from Brighton to Bedford, and First Great Western operate from Brighton to Bristol Temple Meads, Cardiff Central, Gloucester, Worcester Shrub Hill and Great Malvern. The University of Sussex is based near Brighton. As well as this there are 150 primary schools in East Sussex, many of them small and serving small communities. East Sussex has a comprehensive education system with 27 state secondary schools (not including sixth form colleges) and 12 independent secondary schools including Lewes Old Grammar School which celebrated its 500th Anniversary in 2012. Each of the larger towns also has a further education college. There are also a number of independent boarding schools in the county. The Pestalozzi Children's Village, an international foundation, is located at Sedlescombe. ^ a b "Flag of Sussex - Council Arms". Archived from the original on 1 November 2011. Retrieved 8 September 2011. ^ "East Sussex 2019/2020". High Sheriffs Assosciation. Retrieved 16 April 2019. ^ "Met Office:English Climate". Met Office. Archived from the original on 25 May 2007. Retrieved 4 August 2007. ^ Key Statistics: Population; Quick Statistics: Economic indicators. (2011 census and 2001 census) Retrieved 2015-02-27. This page was last edited on 16 April 2019, at 19:23 (UTC).